At the beginning of this year I saw that I had made 54 posts last year. That is just over one a week. I wanted to write more than that this year though I am at the crappy number of 44 posts. SO, I am gonna write words for the the next 11 days and I will beat my 2010 posts by the outstanding number of ONE. So at the beginning of today I the prospects of one kinda average job. By the end of the day I have full time work for all of January at another job that I had no idea about this morning and also found another awesome opportunity. I was a bit of a Debbie Downer when I woke up but yeah Cal pretty much told me to snap out of it as you never know what is coming your way. Yep, he was right. So, HOME ALONE is on the agenda tonight I believe. It is essential Christmas season viewing and then HOME ALONE 2. Just like I bake Christmas cake every year, I try and keep up with another few traditions. I bought a Christmas Tree today, and a real one. It is planted in a white paint tin and about a foot high. I think due to to the fact the last time I had a real one it was a cut one, I was highly traumatised at feeling like the tree had a wasted life, its only destiny was a week period sitting inside dying. Is that even a bit too extreme a belief for Vegetarians? 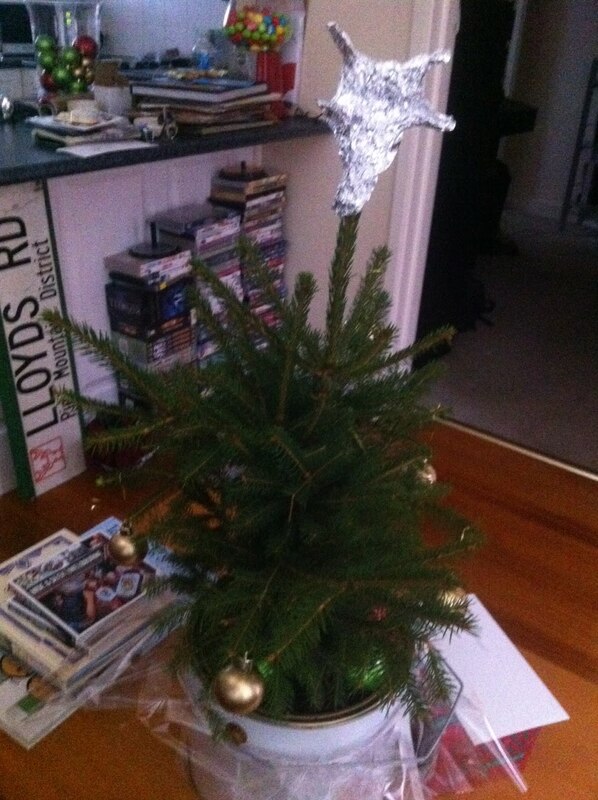 PS how good is my star I made for the top of the tree? Cal looked at it once and struggled not to laugh, but then he just laughed. Way offensive. And picture this.. awkward 12 year old students holding christmas bells on stage, with Amy Grant blaring across the school gym, drowing out the out of tune students for the Christmas concert. It is early December and the gym stinks of sweat and the air is thick in Australian summer. And this song wont finish fast enough… AND you have my grade 6 Christmas concert thanks to Amy Grant. JUST realised I featured Amy Grant in a post. What is happening in my head?